Laptops deserve a little elevation, too. Make your office into an ideal sit-stand workspace by adding the UPLIFT Adapt Mobile Laptop Standing Converter. Take your work to the next level with the UPLIFT Adapt Mobile Laptop Standing Converter, the desktop tool that will alter the way you view your screen and think about work. Enjoy the flexibility and small footprint of a monitor arm with the functionality of a standing desk converter, allowing you to sit and stand while working at your laptop, and giving your laptop an ergonomically-friendly home base when not in use, clearing up desk space. Fingertip adjustment makes transitions from sitting to standing quicker and easier than ever, and built-in USB ports in the Adapt's base offer an easy-to-access place to plug in your mouse, keyboard, or other desktop devices. How does the laptop secure to the mount? There is nothing to secure your laptop in place on the UPLIFT Desk Adapt Standing Laptop Converter. However, it will remain stable as you go from seated to standing. The lack of restraint also makes it easy to grab your laptop when you need to work elsewhere. How large of a laptop will this support? The platform on the Adapt Mobile is 19" wide by 12" deep and can hold up to 15.4 lbs. Can I put my computer monitor on this converter? The Adapt Mobile Converter is specifically designed for your laptop and we do not recommend using it for a computer monitor. Can I use this for a tablet? Yes, the Adapt Mobile Standing Desk Converter would hold a larger tablet just as easily as it would hold a laptop. In order to use the USB ports on your standing desk converter, simply plug the USB cables from the back of the converter into your laptop or a USB outlet. Plugging the USB cables into a USB outlet will allow for charging, while plugging the USB cables into your laptop will allow for data transfer in addition to charging. What will keep my laptop from falling off of the stand? The platform on the UPLIFT Desk Adapt Mobile Converter is level so that your laptop will not fall. Are these USB 2.0 or USB 3.0 ports? The UPLIFT Desk Adapt Mobile features USB 3.0 ports, which provide quicker data transfer rates and faster mobile charging. I only have a USB 2.0 port in my computer, will that still work? Yes, USB ports are backwards compatible meaning the USB 3.0 ports can be plugged into USB 2.0 ports. You will just lose the faster speed offered by the USB 3.0 port. How is this different than a laptop mount on a monitor arm? The UPLIFT Desk Adapt Mobile provides a larger height adjustment range than a monitor arm so that it can be used while standing. 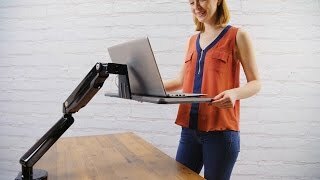 The Adapt Mobile is meant for you to be able to type on your laptop while standing. A laptop mount on a monitor arm is meant to use your laptop as a monitor. How does the Adapt Mobile Standing Converter stay in place after I adjust it to the desired height? When the Adapt Mobile Standing Converter is properly counterbalanced to the weight of your laptop, it will stay in place at the desired height settings. To counterbalance the arm, use the included Allen wrench to adjust the tension screw. Is there a way to organize my cables with the Adapt Mobile? The arms of the Adapt Mobile Desktop Converter feature in-line cable management so that you won't have to worry about your cables being pulled when you go from sitting to standing. Does the Adapt Mobile provide a stable surface for typing? Yes, the Adapt Mobile Standing Converter will remain stable while you type. However, you will not be able to lean on the Adapt Mobile as that would exceed the weight limit. This is a solid design, works quietly, very adjustable and minimal wobble. Easy assembly, all tools included. It is configured for clamping or bolt through a desktop. My built in desk had no option for that, so I designed a wall-mounted shelf/table and clamped the Uplift to that. Works perfectly! $199.00 List Price: $249.00* The list price is the same as the MSRP (Manufacturer's Suggested Retail Price). It may not necessarily be the price at which the product is sold.